Mamma Mia! What’s Up With The Italian Elections?! Late yesterday the Italian elections reminded traders just how mercurial the forex markets can be as its early polls caused a ruckus on the euro pairs. Early election polls showed that the Democratic Party’s Bersani only led the lower house votes by a hair’s breadth. With 99.99% of the ballots counted, Bersani only got 29.6% votes against Berlusconi’s 29.2% win. But what worried market players more was the possibility of a political impasse in the Parliament’s upper house. Apparently, the Democratic Party’s lead of 36.1% isn’t enough to provide its coalition with a majority to pass legislation. Take note that the lower house awards the majority of the seats to the party with the most votes on a national level, while the Senate gives the majority of its seats on a regional basis. More specifically, it allots more seats to winners in larger regions than in smaller ones. If the Democratic Party doesn’t get enough votes, it could trigger political gridlock, which would give more chances for the center-right coalition’s Berlusconi and the Five-Star Movement’s Beppe Grillo (a former comedian!) to breakthrough. What’s wrong with having a prodigal son and a former comedian as Italy’s next leaders? I personally think that the Italian newswires would be a lot more interesting if either wins. After all, Berlusconi has a knack of hitting the tabloids, and I’m sure Grillo can easily humor the public. Unfortunately, they have both expressed their disagreement over Mario Monti’s austerity measures. Heck, Berlusconi has even promised a tax refund! Many believe that a win by either one of them would reverse Monti’s progress over the past 15 months. This poses a huge problem for Germany, who is basically carrying the weight of its euro zone counterparts. In return for bailout funds, German leaders have demanded that borrowers overhaul their economies and implement strict austerity measures. Should the new government discontinue the policies that Monti has worked hard to implement, it could trigger revolts in other nations like Spain and Greece, who have also been incorporating tough belt-tightening measures. Not surprisingly, the polls triggered a run of risk aversion in the markets, as we saw equity markets erase their gains on the day. The Dow Jones Industrial Average was up as much as 81 points, but eventually ended the day down 216.40 points–equivalent to a big 1.5% drop. Meanwhile, the Italian FTSE MIB Index was looking at an intraday gain of as much as 4% before the electoral results wiped it out. Looking at EUR/JPY, we can see that risk aversion had also swept through the forex markets. Word on the street is that once the results came in, some hedge fund managers decided to unload on all those short yen trades. 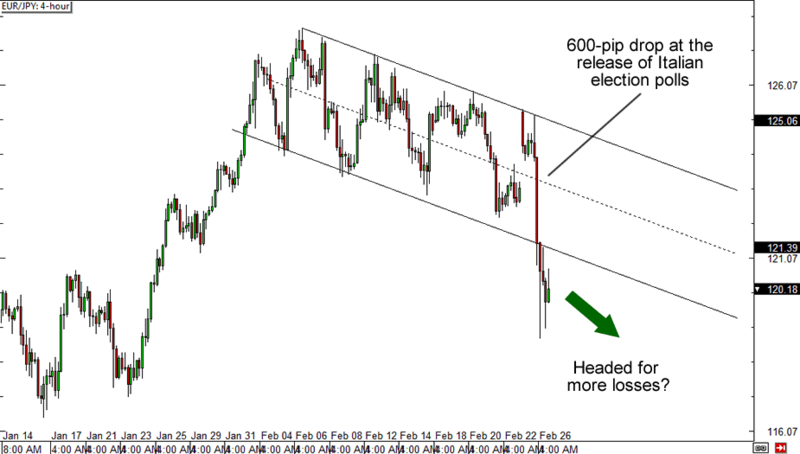 This led to an exaggerated move on EUR/JPY, which dropped to as low as 118.76 before recovering slightly. Yowza! Over the next couple of weeks we may see Italian leaders try and create a temporary government backed by a coalition of left and right-wing politicians. This temporary government could then work on overturning Italian electoral law and allow the public to return to a vote this summer. The problem of course is that the longer this drags on, the probability of allowing instability to rattle Italy increases immensely. It may lead to delays in implementing economic reform, which in turn would unsettle financial markets. What do you guys think? Are you optimistic that everything will pan out, or are we headed for more uncertainty in Italy? Who would you think would win in a fist fight?